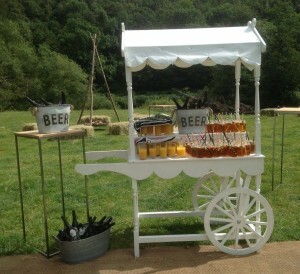 Our Drinks Cart is popular for weddings and events partially due to its flexibility. We know how important it is to maintain a cohesive theme for your wedding, so you can decorate the cart as you wish by adorning fairy lights, bunting or any temporary/non damaging effects that you wish, making it feel like it is your very own. We also hire bunting that reads “drinks”, if you would like us to add those in with whatever package you go for, then simply let us know. It is also a fantastic idea to dual purpose it, using it for your arrival drinks when you reach your venue, and the asking your coordinator to change it over to a candy cart or desert trolley while you enjoy your wedding breakfast, getting the absolute most out of your hire. Don’t forget that Bella Rose offer Day Coordination for you, see more information on our planning packages page. Our stunning cart stands 6ft 8 inches high, 5.5ft wide and 2ft 4 inches deep. Literally anywhere, the cart is sealed and painted white with a white waterproof plastic roof so it can be used inside to further dress whatever lovely venue you have chosen, or outside to help you create a garden party of festival feel. This is a very popular hire item. To hire this brilliant Candy Cart, simply get in touch with us here.